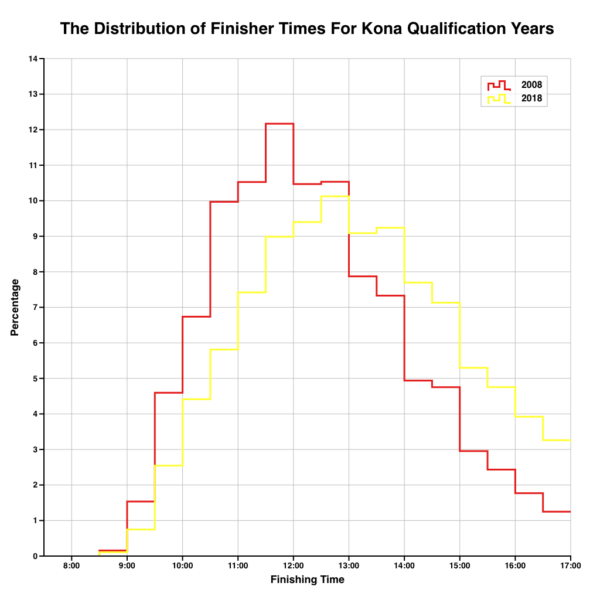 I’ve long considered taking a look at some top level numbers for participation in Ironman based on the years of results I’ve gathered in my database. At the prompting of IMTalk I’ve finally started to dig into those numbers. I’ve not fully mined the depths of the data just yet, but this post is my initial look at the figures with a few charts I’ll be referencing on the show. Before I take a look at the numbers there’s an important limitation to my data that you should be aware of. I have over 400 Ironman races in my database collected over the last 6-8 years. During that time the quality of results available has varied across races. While it’s been consistent for the last year or two in the past it wasn’t unusual for a result set to exclude those who did not start or simply to not clearly identify them from those who DNFed during the swim. This will mean that a small number of events have slightly inaccurate numbers which will have a small impact configures presented here. 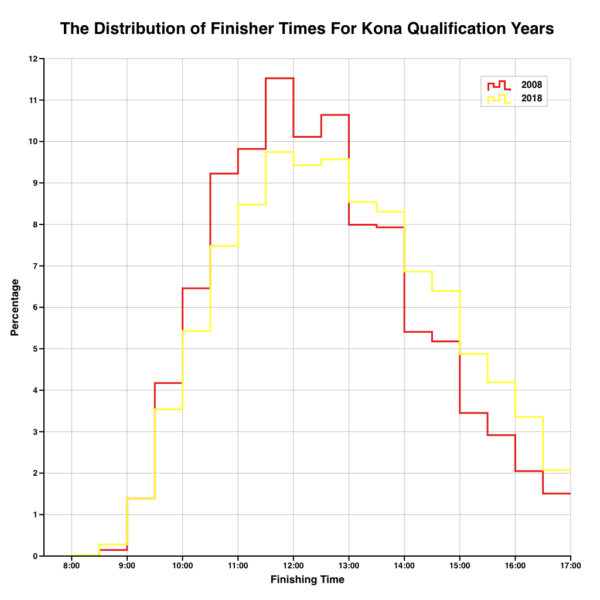 There are two ways we can group participant numbers – calendar years or Kona qualification years. Both have their merits and at the top level the two present a slightly different picture. If we consider calendar years then total numbers appear to hit their peak in 2015 and to have dropped back and plateaued since (allowing for incomplete figures for 2018). If we make the switch to qualification years then numbers have grown year on year, but at a much slower rate since 2015. From the perspective of the qualifier, year-on-year there is still some growth in competitor numbers. I’ll have a look at what that growth might mean for Koan slot competition shortly. Race numbers have grown over the years too. Here it’s probably better to think in terms of qualification years as this eliminates problems of races doubling up in a calendar year. From 2008 through to 2018 Ironman has grown from 20 events through to 41 with a peak of 42 in 2017. 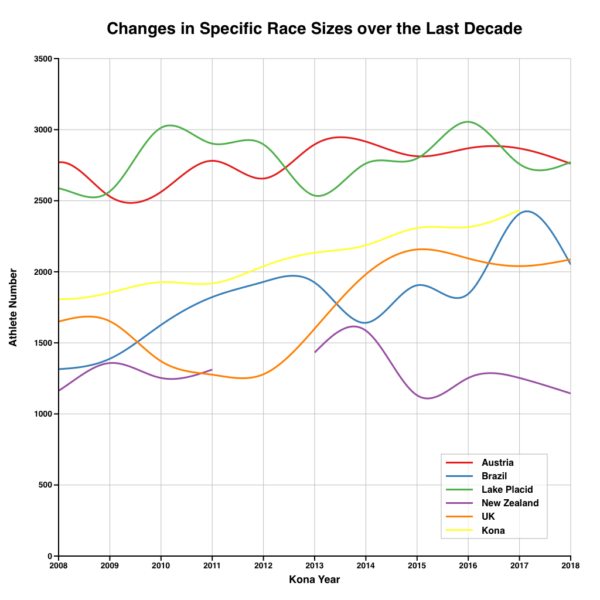 There are twice as many races to chose from now as there was 10 years ago. If we factor in the increased number of races and consider what the average number of race participants looks like year on year we see a decline. The highest averages were hit between 2011 and 2014, since then as race numbers have gone up, athletes are being spread more widely. What this looks like varies with race. For many of the long standing events, race size hasn’t really changed much. Some newer events are seeing growing fields, but some events are seeing a degree of drop off. For the most part though there are some events that consistently draw in a large field and newer races tend to come in somewhere below that bringing the average down slightly. 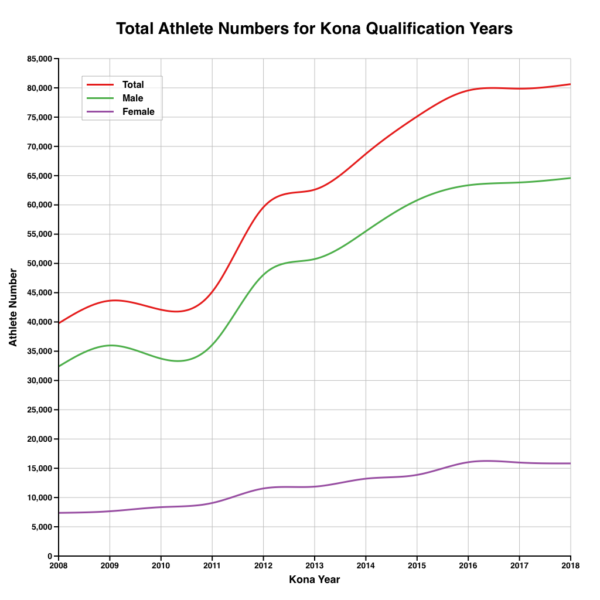 While this is going on the number of athletes at Kona has grown each year. Knowing there are far more athletes racing now than back in 2008 the obvious question (at least for me) is how that impacts on race results. As a simple approach we can compare the distribution of finisher times from two Kona qualification years – 2008 and 2018. 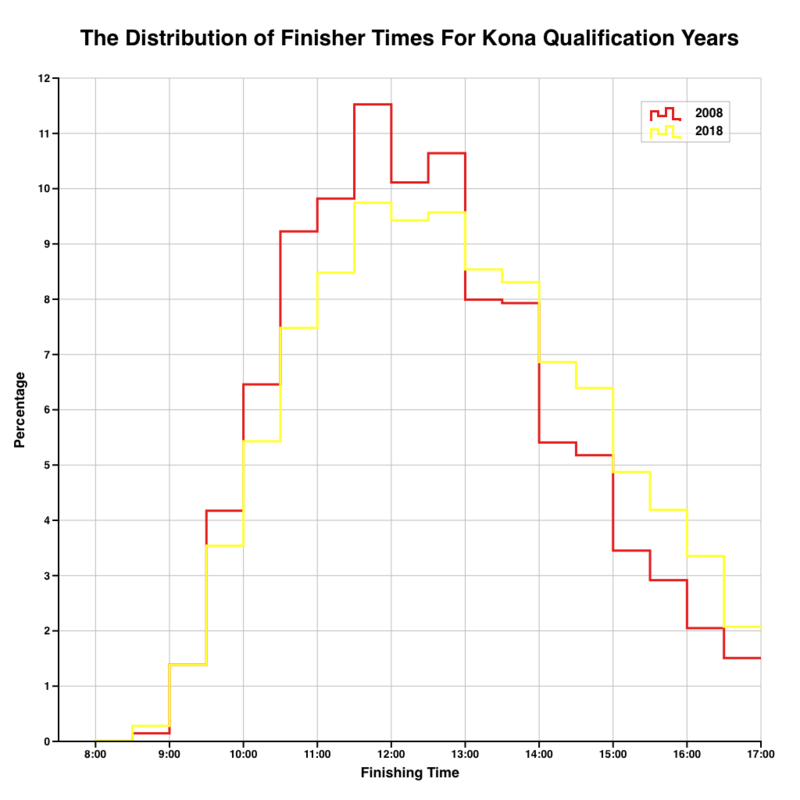 While there isn’t much change in the percentage of athletes finishing at the very front – although the absolute number of athletes at the front will have increased – there is a change to the middle and back of pack. Here we see a wider distribution of finishing times with more in the back of the pack and less in the middle. If I make the graph messier by adding in some of the intermediary years then we can see they transition between the two. 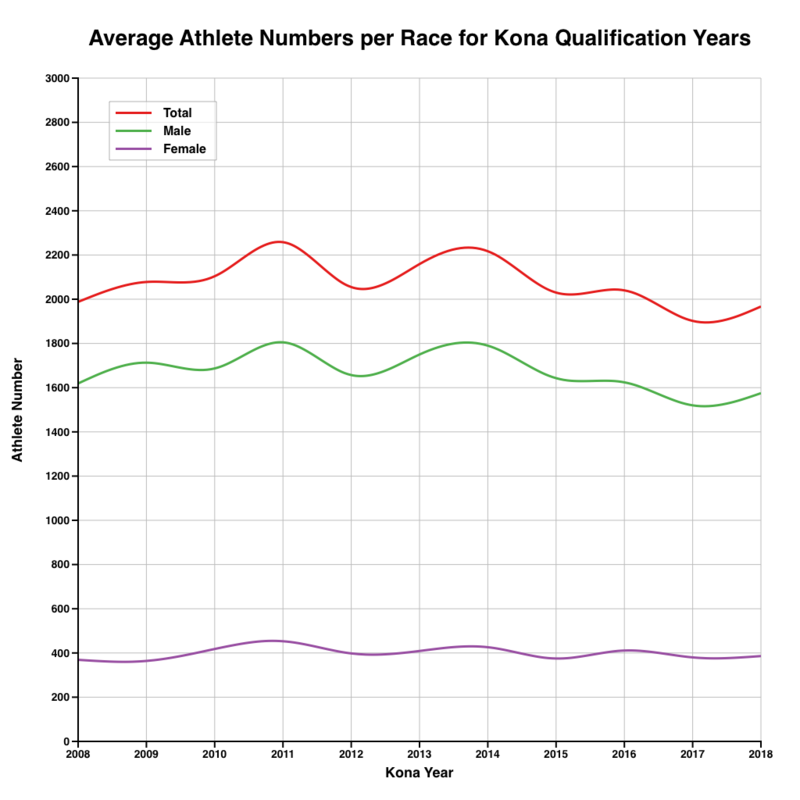 Taking the results of all races as a whole, even excluding all events that were shortened, introduces a lot of potential variability between years. So to minimise that I produced the same chart from a specific set of races: Austria, Australia, Florida, Lake Placid, Lanzarote, New Zealand, Switzerland and Wisconsin. Here the difference between the two years is more extreme. The shift towards the back of pack is far more distinct. What that suggests is with growing athlete numbers the proportion at the front of the race hasn’t changed too much, perhaps declining a little, but the proportion at the back of the field has increased a lot. 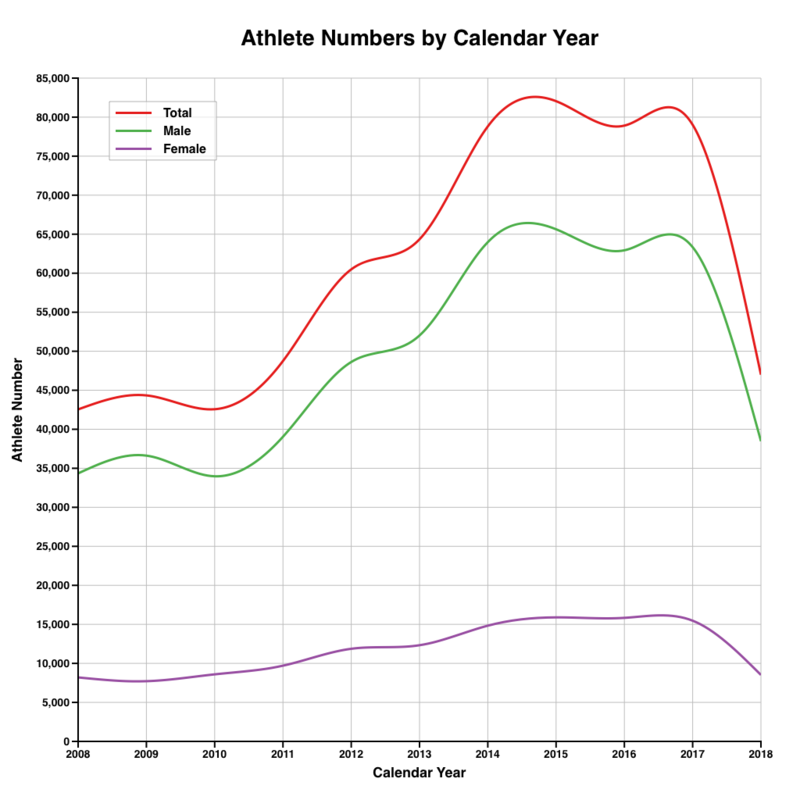 The results of 2018 athletes are more widely spread than those of 2008 athletes. 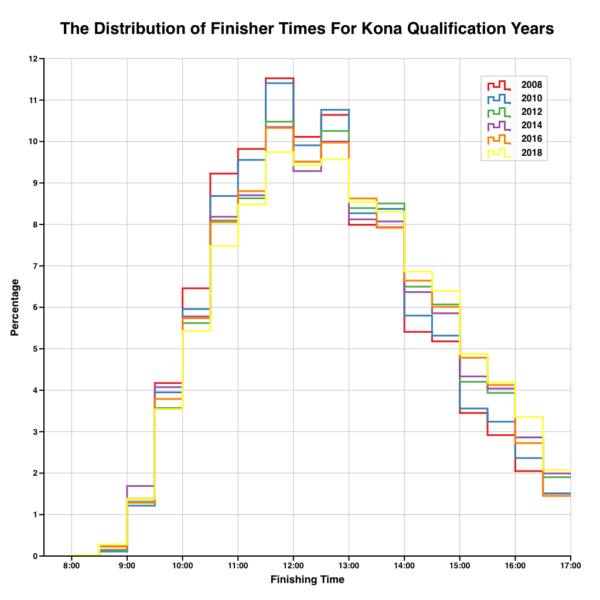 In absolute terms there are more athletes finishing now than in 2008 whether that’s in 16 hours or sub-9. For the Kona competitor there has been growth in the number of qualification slots available, but the number of competitors has outstripped that growth until recent years. That’s a quick look for now. I’ll go into more detail when I chat with Bevan and John.